Happy Fat Tuesday! Tomorrow is Ash Wednesday and the beginning of Lent so today we Party. Next year I will post about how I accidentally ended up in New Orleans with my one year old son and my 8 month pregnant friend during Mardis Gras. (That was an amazing story). But this year Mardis Gras (or Fat Tuesday) sort of snuck up on me as we were supposed to be in New York City watching the Westminster dog show. Instead we are not there. The airline refunded our tickets when they cancelled all flights into NYC over the weekend due to the blizzard. So, here we are, not where we thought we'd be. It is a little discombobulating. Today is also Abraham Lincoln's actual birthday (February 12, 1809) which is a much more serious occassion. In our travels we have also had the opportunity to visit Gettysburg. If you ever get a chance to do this it is worth the trip. It is fascinating standing there in the battlefields, reading the Gettysburg address at the location where it was originally delivered, and imagining what it must have been like back in the 1800's. If you are traveling with kids the key to a super happy visit is to pack the bikes. 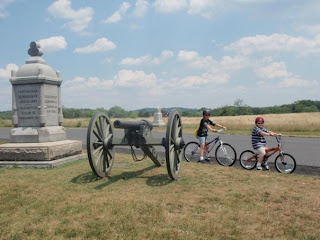 Gettysburg is a big spread out park and it is much more difficult for kids to look out over a big open field and fully comprehend the full impact of what they are viewing. With the bikes the day was a fun adventure - without the bikes it would have been a long boring walk. The nice thing about Fat Tuesday is I always know what we are going to have for dinner. Pancakes. Laissez les Bon Temps Rouler! Have a great Fat Tuesday and a wonderful Abraham Lincoln's Birthday.